Happy MLK Day, everyone! I had a fairly busy weekend, which was a bit unexpected. My mom and sister came into town to host a baby shower for a friend, so it ended up being a super productive weekend. Yesterday the three of us went to church, followed by lunch at Cafe 43 and a tour of the George W. Bush Library & Museum. The museum was well worth it, but you’re in for an emotional overhaul. The 9/11 exhibit had me in tears – they even have a piece of the frame from one of the towers on display. It’s truly gut-wrenching. 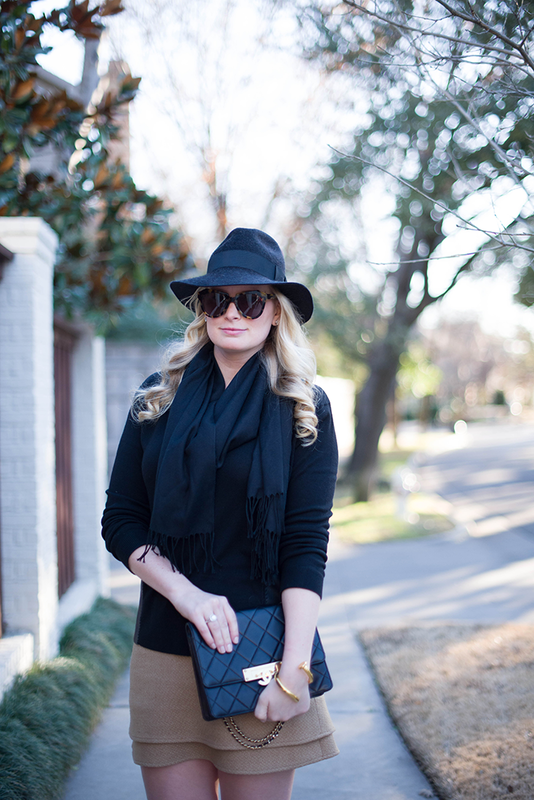 On to more cheerful things like my outfit… Don’t you just love the color combo of camel and black? It’s so classic and easy. I picked up this skirt at Neiman’s a few weeks ago on super sale, and it goes amazingly well with my new Robert Rodriguez leather-paneled sweater. The weather in Dallas has been fairly mild, so it’s been nice not having to wear tights with my leg-baring outfits, but if I do wear them, this pair by Wolford is my favorite! 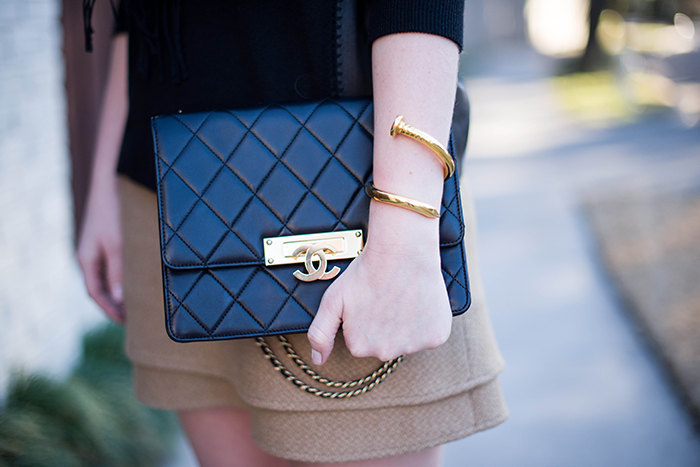 I love the black and camel combo, it is so classic. Love this look. The black and camel color combo is beyond chic. That cuff is to die for. Loving this look on you! Great sweater that can go with everything! Love this look and those shoes! This is a fabulous look…I’m loving the shape and color of that skirt, and all the textures together! So classy & chic! What I would give to be able to go bare-legged right now!! So chic, lady! Your hair looks amaaaaazing! Love everything about this look! That jacket is amazing and your hair looks gorgeous! Pinned it! Love that Rachel Zoe skirt! And your hair looks amazing!! You look perfect! Love the look!!! Such a pretty skirt! So sad it’s sold out :( Good to know about the Bush library…I almost went when I was home in December, but the lines were crazy crazy. Sounds like you need to devote a whole afternoon and be pretty mentally prepared. Ahh I felt the same way at the 9/11 Memorial in NYC – SO moving and I could not hold the tears back. I ADORE this! Pinning it right now! Merrit love the outfit! You look great! I am loving every detail about this outfit! Especially your Chanel. The hat and cuff are amazing! My boyfriend and I went to the grand opening ceremonies of the Bush library. I was like you, in tears at the 9/11 exhibit but in absolute awe of all the artifacts and memories kept inside. Your neutrals are absolutely lovely, that hat it perfect! Love the details of each piece, especially the skirt! Such a great sale find! I am loving that cuff, super fun. This look is fabulous!! I love the skirt, love the sweater and love that cuff!! You look gorgeous! Such a beautiful combination and I love how classy it all looks! The leather may add an edge but doesn’t rid the outfit from it’s elegance! Yes! Classic color combo. Love the skirt too. I LOVE that cuff. So cool! 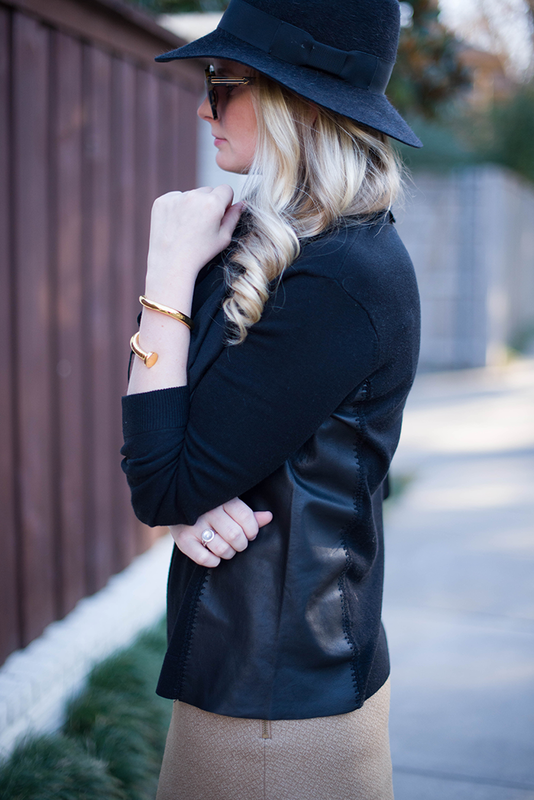 Black and camel are my favorite together and you pull them off beautifully! merritt! this is all gorgeous! I’m loving that sweater and those heels! if only it would get a tad warmer here …. Looking gorgeous and keeping your resolution. Go girl!